We all hate to say the “S” word around this time of year – but the SNOW is coming, and with it comes an influx of RATS. As the temperature drops the. We all hate to say the “S” word around this time of year – but the SNOW is coming, and with it comes an influx of RATS. As the temperature drops the ground freezes, and food sources that our furry foes once had in abundance, become unavailable or frozen. Rat colonies then get forced indoors to find warmth and food for the winter. Rats are extremely adaptable regarding habitat and diet and will eat just about anything humans eat. They are happy to coexist with us in just about every environment. Rats have been calling the Okanagan home more and more as of late. Kelowna has surprisingly moved up to B.C.’s 6th “rattiest city” and Vernon is now making the list – coming in at 18th. Evidently, tech companies and winemakers aren’t the only ones setting their sights on our beautiful valley. Rats are on the rise, and they aren’t going away any time soon! Rats pose a problem for Okanagan homeowners because they can contaminate food, cause major damage to the structures they inhabit, and, of highest concern, spread deadly diseases. They have been appropriately nick-named “disease sponges” due to their susceptibility to the numerous diseases they encounter in sewers, parks, and within their own colonies (among other pleasant places). Rats will cause structural damage in buildings by chewing through wood and insulation, and trigger fires by gnawing on wiring or floods from puncturing water lines. In garages, rats will nest inside cars, where they will also chew through insulation, wires, and hoses. Your best bet for rodent-proofing your home is to remove access to food, water, and shelter. Keeping vines and climbing plants trimmed back, fruit and nut trees maintained and removing all dropped and rotten fruit will help reduce the risk of rodents around your home. Also, be sure to keep areas around bird feeders tidy, as these are a major attractant for rodents and other animals. Keeping pet food and waste cleaned up, (scoop that poop!) is another best practice for deterring unwanted guests. Also, removing potential harbourage locations (tall bushes/weeds, piles of wood, litter/trash, etc.). Lastly, checking the entire perimeter of your home for any possible access points – including missing vents and screens along the foundation of your home, any opening bigger than the size of a quarter (from the basement to roof, as rats are skilled climbers! ), deteriorated weather stripping, and damaged soffits. To protect the interior of your home, reduce the number of possible food sources you may be unknowingly offering up to rats. Droppings, runways (rats and mice will use the same pathways repeatedly, leaving traces of wear and greasy streak marks), burrows, and gnaw marks. For a more in-depth look at signs of rodent damage, there is a great article here. Infested homes and properties are always best dealt with by a pest control specialist. At BugMaster we offer an exclusive baiting and monitoring program that allows us to monitor your bait stations periodically. 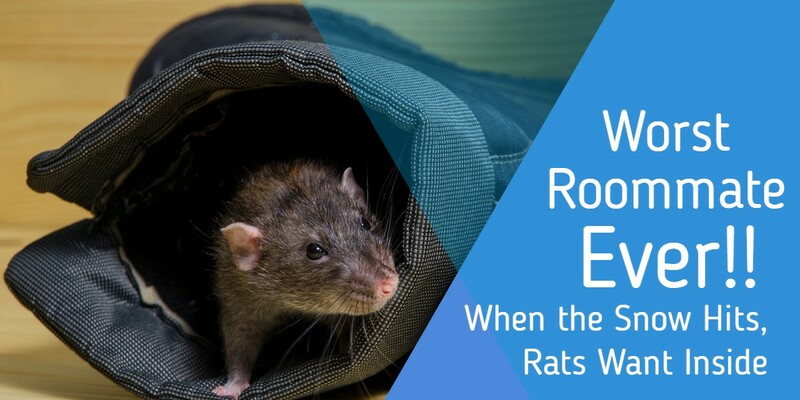 We’ll take care of the rat eviction notice for you, so you don’t have to deal with the smell, the poop, the rats themselves, or anything else that comes along with the worst roommates ever! For more information on our rodent programs, or to book an inspection, contact BugMaster today!